I participated in a campaign on behalf of Mom Central Consulting for Aflac. I received a promotional item as a thank you for participating. I’m a planner. Always have been. I realize that a lot of people aren’t planners, though. Especially the younger you are…. you think you’ll live forever. You don’t think of your mortality. But it doesn’t matter how much I plan and prepare, there’s always the possibility of the unexpected. Usually this happens when everything is going smoothly. Then out of the blue, it happens — an accident. If you have kids, it’s unfortunately, comes with the territory. Whether it’s just the bumps and scrapes of children being children, to broken bones, to the more serious accidents or illnesses, unexpected medical bills can hurt. Really hurt. I personally know of people who have lost everything because of medical bills. Many of these families, like mine, have insurance coverage. Yet, there are still deductibles, and out of pocket expenses that we don’t think about. We can also expect medical expenses to continue to rise with many employers trying to make cutbacks to shift more and more of the costs onto their employees. You. My husband and I are self-employed so we have private insurance. We kid that we are insurance poor. Not really sure how much of it is really kidding though. We also, like many people, have no dental or vision coverage. 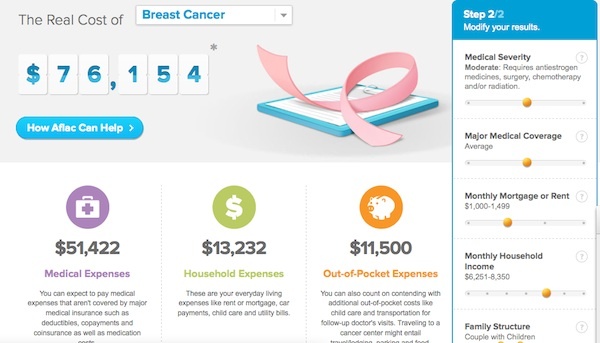 So it’s easy to see how an unexpected medical expense could hurt the family finances. We have a savings account just for medical emergencies… hopefully we’ll never need it, but if we do, it will help. I know of several cases where people assumed they were covered for certain things, to only find out they actually were not covered. The legaleze of the insurance language isn’t always an easy one to translate for the ordinary layperson. I love the Aflac Real Cost Calculator (RCC) — it’s an illustrative, interactive tool that shows you the average out-of-pocket expenses associated with a number of different injuries and illnesses. You can adjust the information that makes your life unique, such as your salary and rent/mortgage. 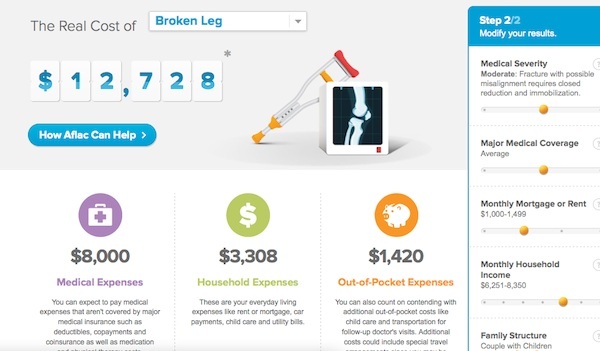 As you can see just a broken leg could cost you almost $13,000 even if you have insurance. You still have bills to pay, but may not be able to work or at the very least, lose a few days of work. Being a woman, I know that there is the real possibility of getting breast cancer in my lifetime, looking at the RCC I was surprised to see hom much it could cost me above and beyond my insurance coverage. Check out the Real Cost Calculator for yourself. How do you prepare for medical emergencies? Do you use Aflac? And if you have any tips or advice on preparing for medical events, we would love to hear them. The thought of a medical emergency is scary enough but to learn you aren’t covered and then be put in a financial situation makes it almost unbearable! It’s scary how much some aren’t prepared! We really want to get Aflac before something happens & it’s too late. Thanks for sharing, this is just the reminder that I needed! I’ve always wondered about Aflac. Wow, I can see why so many people declare bankruptcy due to the medical bills from cancer. I hope more people learn about this plan. It’s crazy how expensive things are.. So scary and so important to have a back up. It’s so important to be prepared. Thanks for the handy calculator! My husband’s insurance is really quite good at covering most everything, but I can so see the need of supplemental insurance! It’s definitely important to be prepared.